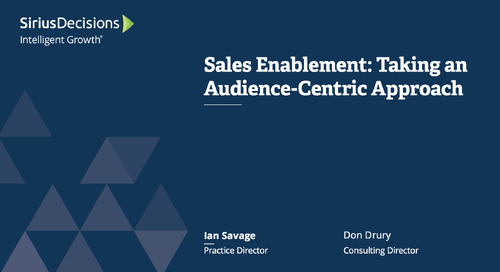 SiriusDecisions helps sales enablement leaders prioritize enablement efforts to ensure every rep has the skills, knowledge, process expertise and access to the assets to maximize every buyer interaction. We do this through the lenses of sales talent management, sales asset management and sales communications management. Explore content for this role below. Reps in high-performing companies spend 26% less time searching for and managing sales content than those in low-performing companies. High-performing companies are 18% more likely to complete formal onboarding for all sales roles within six months than low-performing companies.